April is here! As the plants begin to pop up through the dark soil, the days become longer, and the sunshine gets warmer, the invitation this season can be about stripping down the many barriers between the outer world and our true selves—be it literal layers of clothing, or figuratively, the layers of holding and contraction in and around our bodies. As we take off the many layers, perhaps one of spring’s most profound offerings is to allow ourselves to truly be seen. I saw my neighbors for the first time in what feels like months. We were all outside, raking, tidying our lawns, and absorbing the warm rays of the spring sunshine. Winter has a way of holding us tightly insulated, under the layers of clothing, GORE-TEX, and down as well as within the walls of our homes, workplaces, or other establishments. As the light increases and the temperatures warm, spring then becomes an offering to unlayer and to allow ourselves to really be seen. There is a very literal interpretation to this—we just wear less and are out more. But, more figuratively, we can see this delay as an offering to soften and expose many layers that have been keeping us hidden from ourselves and each other. Are there ways in which you have closed off from sensing, feeling, and being? Are there ways in which you have become disconnected to feelings and sensing with your own skin, eyes, ears, nose, and mouth? As author Lorin Roche writes, “The senses declare an outrageous world.” Can we all be guided to keep coming back to our senses? How do we stop the rushed and busy heart and allow ourselves to become more alive and present? We can taste this from day to day when we consciously pause, lean back and take a deep breath in, or watch an eagle soar overhead, or catch the first rays of the sunrise, or watch your child catch their first wave or take their first steps. In that brief moment of conscious thought and feeling there is remembrance. Remembering the sacred quality in our own breath, remembering we are living on this earth together, remembering the small miracles happening in every moment. A simple, yet conscious experience can offer us so much if we are ready and willing to receive it. Pema Chodron once said, “Don’t let the world go harden your heart.” Let’s keep working to cultivate ways to keep our hearts, eyes, and minds open and available to all that is. The yogis speak to this natural covering up that happens, or disconnect from our true source of self, as avidya, known as a veil of ignorance disconnecting us from our own truths. When the layers or veil peels back, we are steeped in remembrance of our true nature and connection, which is love, bliss, and connection to all things. But we forget this. One of my teachers coins this “cosmic amnesia;” we forget that we are made up of the stars and share the same source of internal light and life. Avidya is a veil that is part of the human condition. We all have it. We all need opportunities to stop the pace of doing and allow ourselves to be. There is true power in the pause. The pause connects us to a deeper sense of knowing and understanding. 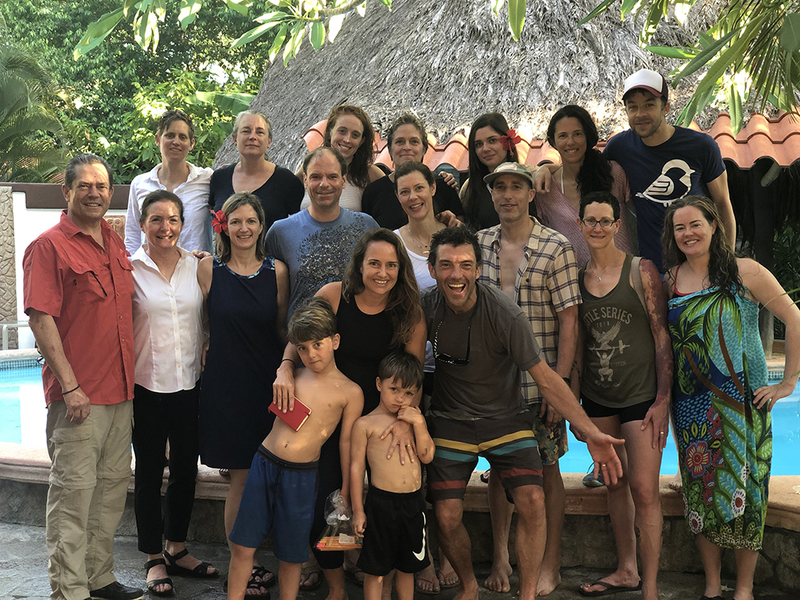 My time in Costa Rica this year was such a reflection of what is possible when we allow ourselves to open, release the layers, and allow senses to receive. It started quite literally when landing on the tarmac, off went the socks, then sweater, then long sleeves, and minute by minute the necessary layers between me and the world were disappearing. Once at the seaside jungle, off went the cell phone and the clothing. Left almost naked in the jungle, the lines between my body and the vibrantly awake seaside jungle became somewhat porous. I was either covered in sweat head to toe or covered in saltwater every day. My body started to move like waves, be it sitting on my surfboard or standing on land and feeling the wind touch my bare skin. My innately wild self was felt, seen, and heard. I felt amazing, vibrant, and alive like the jungle. I saw this happening to my whole family (my two boys and my husband), and all the participants on the retreat. There was an overall softening and coming into being. We moved in rhythm to the waves and the sun (and of course the howler monkeys and their early wake-up howls). Collectively we were coming into seeing each other more clearly. As I can not justify wearing a bikini to the airport, the layers soon went back on when it was time to head back to the States. But, the taste of Costa is still very much lingering in my memory and felt sense in my heart. I realize we cannot all be on vacation every day, or even once a year, but we can all more consciously hear the call to slow down enough to listen, feel, and remember our true wild nature. The studio is a space that invites us to reflect, to feel, and to remember. On our mats we can be embodied, we can feel, sense, touch, taste, and hear our own needs. Every time we practice we are saying to ourselves, “I see you, I hear you, I respect you.” When we practice in community, we are allowing ourselves to be seen, to share breath, experience, and tenderness with one another. We all pattern some kind of holding, layering, or hiding, but together we are creating a space and a community that welcomes us to be seen in all our various layers. Come open up with us, shed a few layers, and step into your fullest sense of being alive and seen this spring. To you and your beautifully naturally evolving self!